Railpictures.ca - Bill Hooper Photo: A mishap on CN east of Kamloops resulted in detour over CP. An eastbound auto racks departs Salmon Arm on Shuswap Lake. | Railpictures.ca – Canadian Railway Photography – photographie ferroviaire Canadienne. 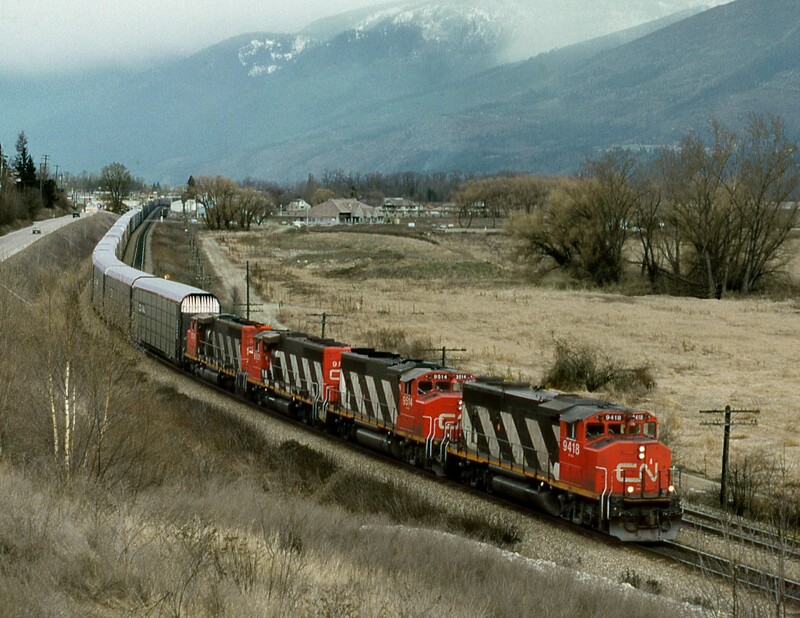 Caption: A mishap on CN east of Kamloops resulted in detour over CP. An eastbound auto racks departs Salmon Arm on Shuswap Lake. Exactly what I thought when I looked at this. Who would have ever thought that it would be refreshing to see 3 GP40-2′s and an SD40 leading a train?